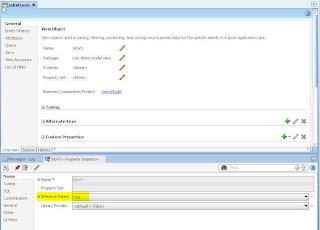 To learn the basics of date-effectivity in ADF, please go through my post Learning basics of Date Effectivity in ADF. To learn how to create date-effective EO, please go through my post Creating Date Effective EO. 1. Open Association -> Goto 'Relationship' tab -> Behavior -> Check 'Effective Dated Association' checkbox. Marking the association 'Effective Dated Association' will take effective date into consideration while searching, inserting and updating the records. 1. Mark the VO as date-effective by setting EffectiveDated='true' for the VO. You can find this property in 'General' tab property inspector. Specifying the above property for the VO will generate a new transient attribute called SysEffectiveDate in the VO. 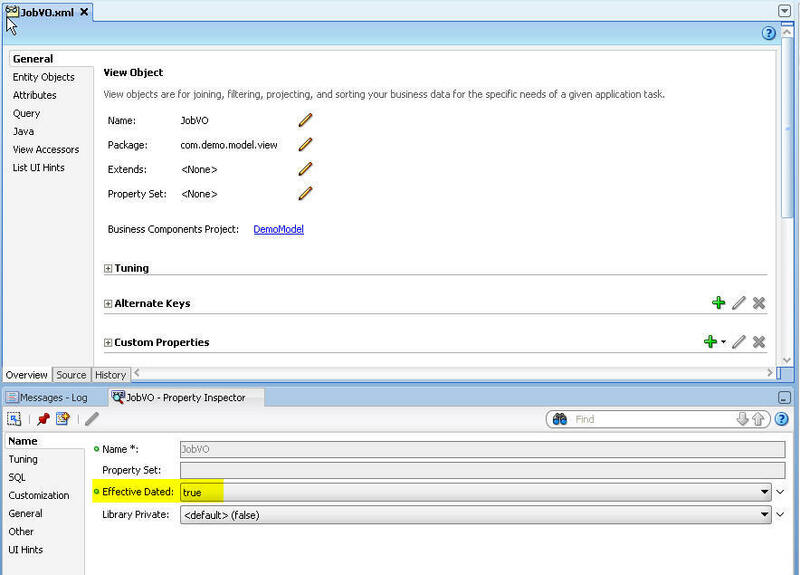 2.Optional: Change the data type of SysEffectiveDate attribute to 'java.sql.Date' from 'oracle.jbo.domain.Number'. We'll often find it easier with native Java sql data types instead of using Oracle's jbo datatypes. It is recommended to use java native sql type(java.sql.Date) for all date type attributes in the EO. Marking the VO effective dated, will support date-effective updates for a single record. Nice blogging Murali.. keep it up.. Thanks Gaddam :) Howz your life at Bangalore? Everything Settled?